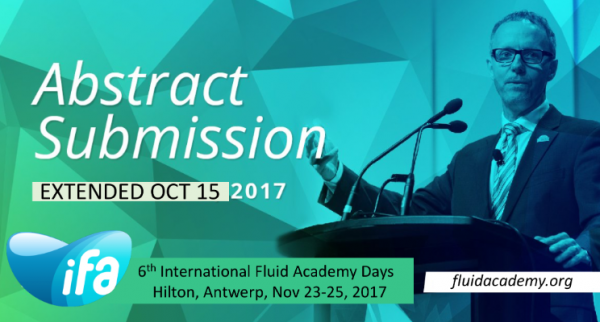 Because of high demand we have extended the abstract submission deadline for the 6th International Fluid Academy Days untill October 15th . This is the last call to submit your scientific abstract for poster/oral presentation (accepted abstracts will be published in the PubMed listed official IFAD journal Medical Fluids: Anaesthesiology Intensive Therapy). The 6th IFAD meeting will offer the opportunity to discuss your research findings with esteemed international faculty and participants. This is a unique opportunity for residents and fellows to present their data and study results or ideas for future studies on an international forum. The iFAD Organising Committee welcomes scientific papers on (hemodynamic and organ) monitoring and fluid management in critically ill patients, but should not be confined to monitoring or fluids alone, any broad ICU related topic will be considered for presentation.